I popped along to Tunstead’s St Mary’s Church to offer a helping hand. It was part of the preparations for a busy month at the church. Keeping the church spruce falls into two principle activities; work on the inside and work on the grounds. Whilst the fabric of the church has to remain untouched, as the building is hundreds of years old and is left to the experts, there is still plenty to do. Jobs inside the church get done on the morning of the day before a service to make it presentable for the small but faithful congregation. There is cleaning, sweeping and dusting to do. The cathedral-like size of the church means that the more hands there are to share the work, the better. Outside there is the regular activity of grass cutting, and tree trimming. This too, is left to experts with the skill and means to do it. However, today we were there to clear away the moss and ivy from the concrete plinth that surrounds the church. This keeps the area presentable, as well as preventing the growth from getting a foot-hold on the precious stone-work. Some of this clearing work had already been done on a previous occasion, so we concentrated on the north side of the church. Moss tends to collect on the flat concrete as this area remains damp because it is often in shadow. Again the stone-work of the building is left alone so to prevent unnecessary damage. The team set-to and whilst it was quite hard work, the moss, weeds and ivy were soon eradicated. We also checked and cleared blocked gullies and downpipes which if left unchecked would allow water from the roof to spill onto the area around the base of the church, so exacerbating the problem of damp in which the moss would thrive. Once we had done a circuit of the church foundations for a final check, we felt that the morning’s work was well done, and stopped for a coffee and a chat before departing. We had a team of over half a dozen, and work shared meant less time was needed to get things done. During coffee we discussed the coming events for July. Firstly is Evensong. This service starts at 6:30pm on 9th July. Later that week; Wednesday 12th July, is bell ringing. 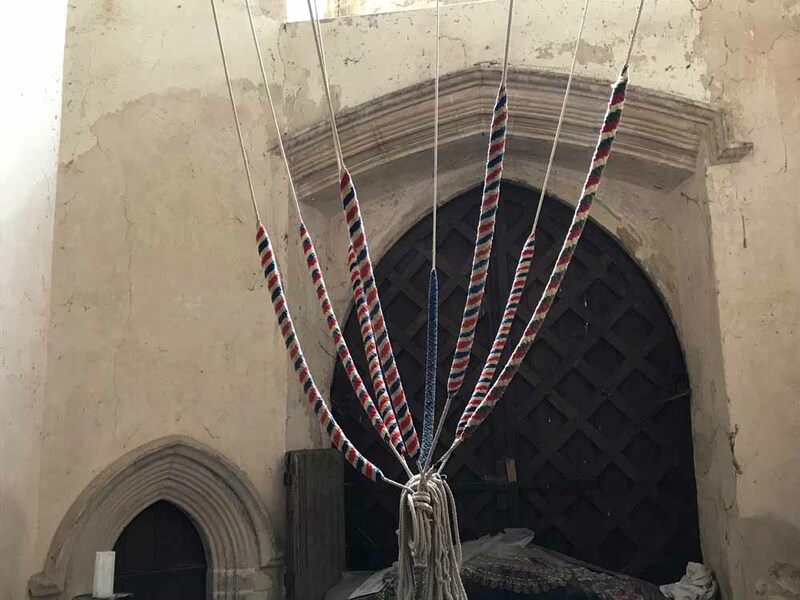 This is an exciting occasion as a group of touring bell ringing experts will demonstrate their skills for half an hour or so “ringing the changes”, using St. Mary’s eight bells. This event starts at 4:00pm, and refreshments will be available. Later in the month the church will be prepared for a wedding on the 29th. Sunday 30th the church whose doors are always open anyway, will have a public display of the flowers used to decorate the church for the previous day’s wedding ceremony This event runs from 2:00pm until 4:00pm. St Mary’s also hosts its monthly Sung Eucharist Service which starts at 10:30am on the 30th. Please come along to the open house on Wednesday 12th at 4:00pm to listen to the bells or pop along on Sunday 30th to view the flower displays. Of course you are welcome to any of the church’s regular Sunday services. This entry was posted in Articles, Blog and tagged bell ringing, church flowers, cleaning, St Mary's Church, Tunstead church. Bookmark the permalink.